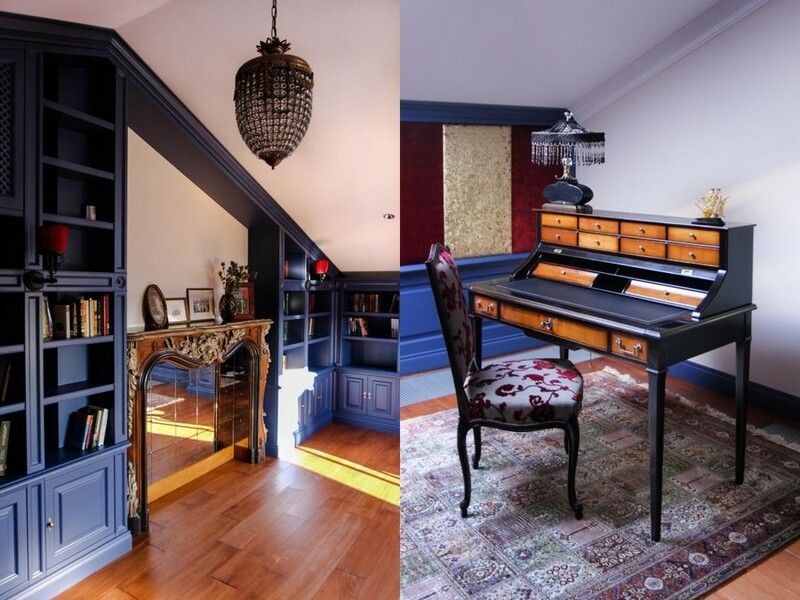 This attic floor interior design is gorgeous and all because the owner of the house appeared to be very bold – she kept encouraging interior designer to be more daring in their experiments. This is not a common practice among decorators’ clients, who are traditionally more inclined to restrain designers’ imagination. But in this case the decorators dealt with a very big and active family, who love new impressions and visual experiments in particular. Hence the authors of the project felt free to use bold color combinations, combine floral motifs and geometrical prints, and mix contemporary and classical furnishing. 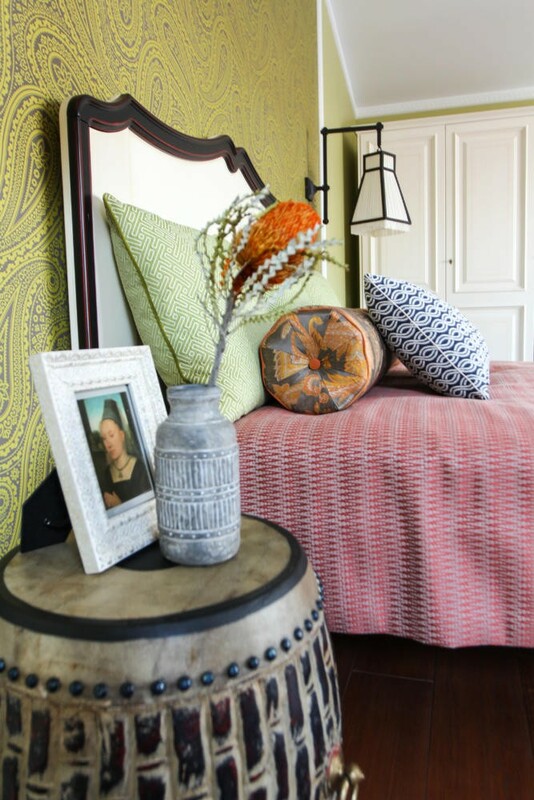 Let’s have a closer look at the resulting eclectic interior diluted with ethnical motifs! For a start a small layout change was made: a tiny guest bedroom was combined with a home library to get a big full-fledged space with a ceiling height of 3.8 meters at the upper point. 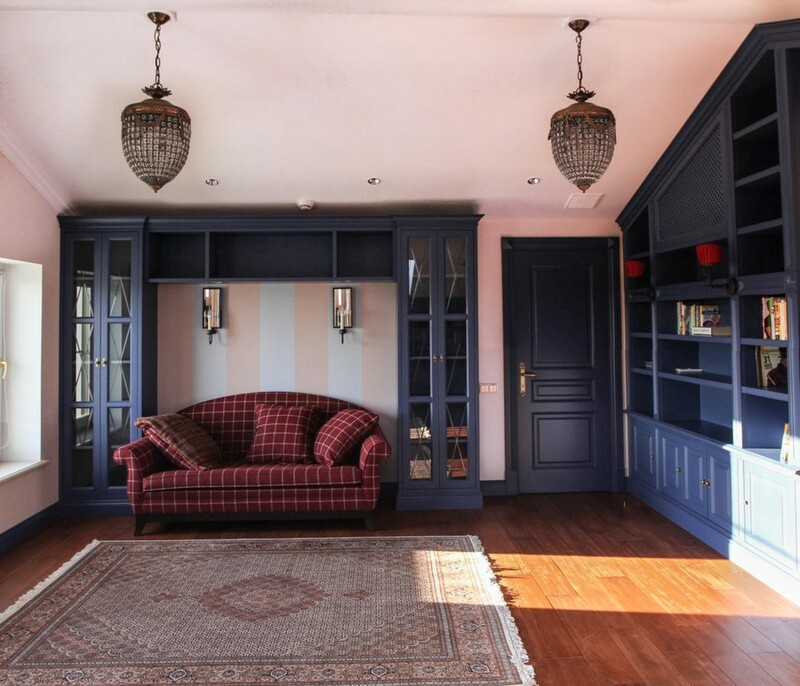 To emphasize the beautiful sloped ceiling height it was decided to make floor to ceiling home library and arrange a faux fireplace with an empty white wall above it. 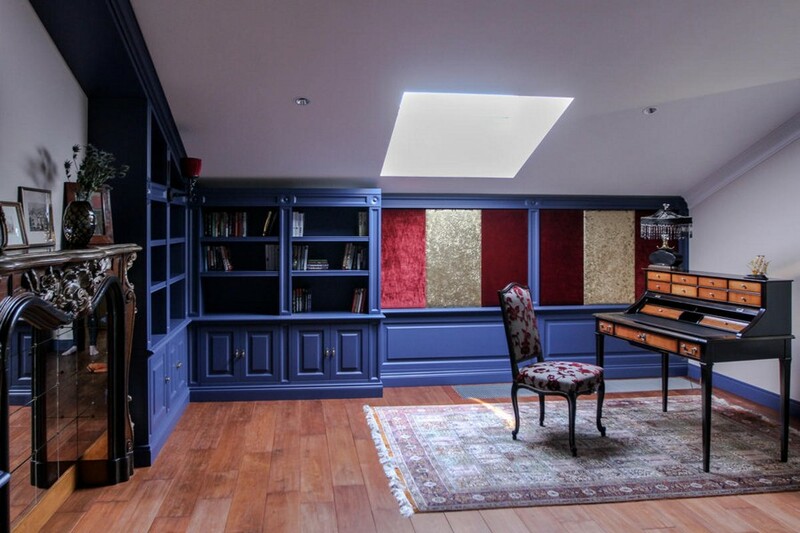 Book shelves of ultramarine blue color were custom-made within a few months. The furnishing of this room is composed of a ready-made sofa with an upholstery by a different brand, a marvelous classical desk and an antique fireplace brought from France. 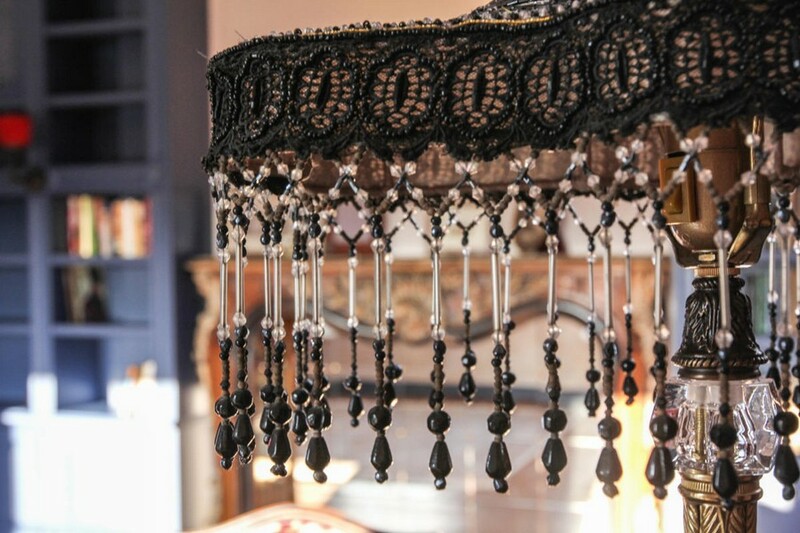 Its mantel is decorated with photos carefully picked on a famous Belgian flea market. The carpets are Iranian. As for the red wall lamps lighting the book shelves, there is a funny story about them: the construction team proved to be pretty creative and had them installed upside down. The mistress liked the idea and they were left that way. Bathrooms required special attention due to pretty low sloped ceiling, especially as regards comfortable mirrors arrangement. In one of the rooms the problem was solved by a small round mirror, and in the other – by hinges. Both rooms have equal status, and accordingly it was determined to design them in a common scheme: black-and-white flooring in Mettlach tiles and colorful walls. 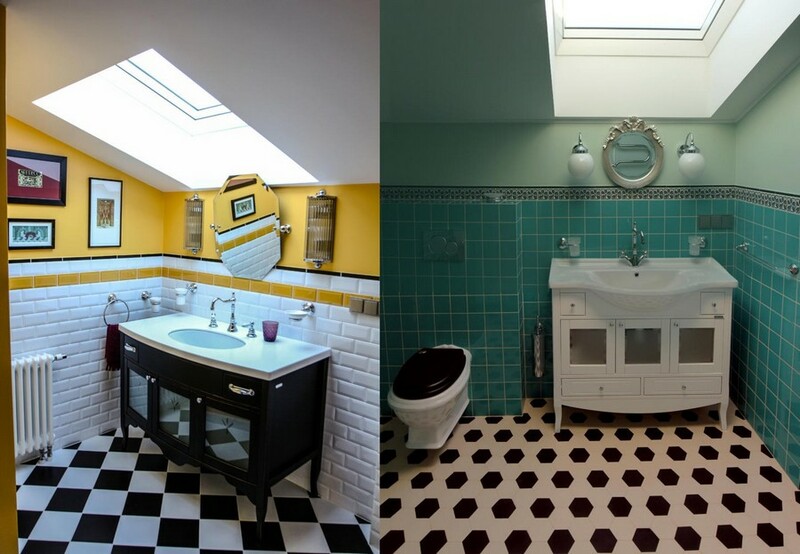 One of the rooms is finished with turquoise tiles and nicknamed “nautical” and the other features bright yellow paint and the masters call it “sunny”. When it came to bedroom interior, the most difficult task was preserving the sense of privacy within a big ceiling height and avoiding the half-empty look of such an intimate place. So the choice was set upon a French bed with pretty tall wooden headboard and matching bedside lamps. 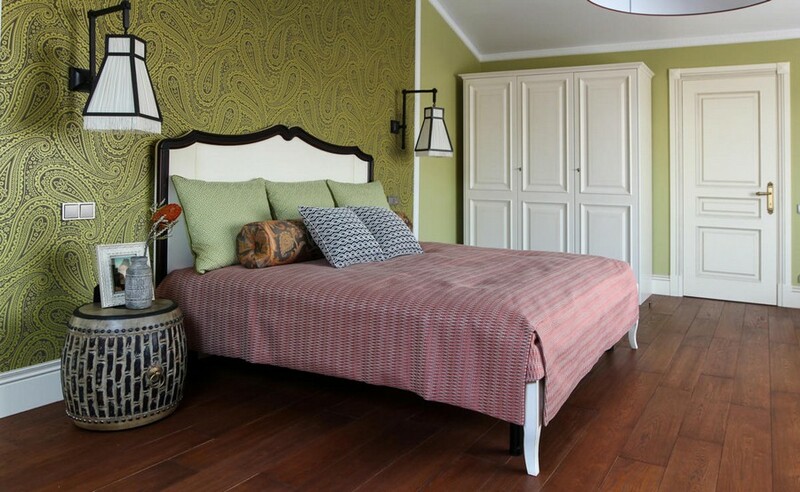 The latter were selected because of their quiet big size, which is intended to soften the ceiling height, and dark brown trimming coupled with white textile lampshade that perfectly matches the headboard. The wall behind the bed was coated with beautiful wallpaper setting the right vertical in the room. Ethnical notes were brought by nightstands and supported by means of home textile: a bedspread pattern and a group of decorative pillows with “twisted rope” print. And not to overload the room with ethnical motifs it was finished with a hyperbolical ceiling lampshade.